Our thanks to Peter Jordens for bringing this item to our attention. 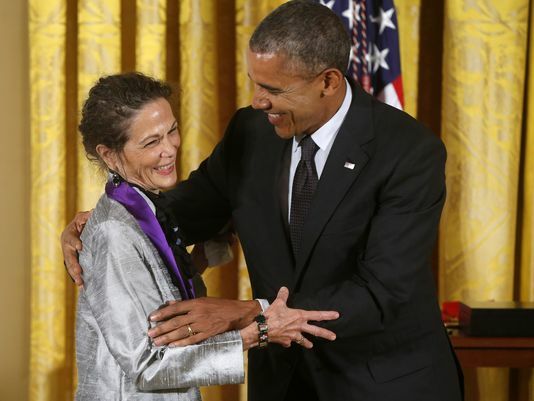 After receiving the 2013 National Medal of Arts on Monday, Vermont author Julia Alvarez took her seat in the audience at a White House ceremony and snapped photos of fellow recipients with her iPhone, Nicole Gaudiano reports for The Burlington Free Press. Alvarez, author of books including “How the Garcia Girls Lost Their Accents” and “In the Time of the Butterflies,” has received numerous awards for her work. But this one — the highest award the federal government gives for the arts — was special to her, in part because she received it with people who inspired her, she said. “I wanted to be able to share it with family and friends who couldn’t be here,” said Alvarez, of Weybridge, after receiving the award. A writer-in-residence at Middlebury College, Alvarez was among a dozen recipients of the 2013 National Medal of Arts from President Barack Obama and first lady Michelle Obama. “Your accomplishments have enriched our lives and reveal something about ourselves and about our country,” Obama told recipients during the ceremony. Alvarez was born in New York City but moved with her family back to the Dominican Republic at 3 months old. Ten years later, her family fled the country because of her father’s political activities and returned to the United States in 1960. Alvarez said the award was special for many reasons, including that it was presented by the first African-American president, “a real writer.” Another reason: Maxine Hong Kingston, author of “The Woman Warrior,” was among her fellow recipients. Alvarez said she never thought immigrants’ stories would be part of American literature until she read Hong Kingtston’s stories of Chinese immigrants living in the United States. Winning the award made her think of her late parents and “how they were so worried that we would be sent back if we didn’t prove that we were good enough,” she said. Alvarez, who is on the board at Vermont’s Shelburne Farms, said she brought the first family a cookbook with recipes from students and farmers who participated in the farm’s sustainability program. She also spent a lot of time deciding which books to give them individually. She didn’t get to present them on stage, but she mentioned her gifts to the first lady. For the president, Alvarez settled on “A Wedding in Haiti,” a non-fiction novel dealing with immigration issues. “And he’s in the thick of that right now, right?” Alvarez said. Michelle Obama received “The Woman I Kept to Myself,” poems about becoming a woman with a voice, she said. Alvarez said she gave that to Michelle Obama because the first lady is a powerful example for women and young girls. Alvarez thought of children’s books for the girls until she researched the young women. “When did they grow up?” she asked. Monday’s ceremony also honored dancer and choreographer Bill T. Jones, who has worked on several projects commissioned by the Flynn Center in Burlington. Other recipients Monday were the Brooklyn Academy of Music; arts patron Joan Harris; musical-theater composer John Kander; film director Jeffrey Katzenberg; documentary filmmaker Albert Maysles; singer Linda Ronstadt; architects Billie Tsien and Tod Williams; and visual artist James Turrell.